For a nutritious lunch or dinner try a Black Bean Quinoa Burger! These patties have just the right amount of kick. This vegetarian recipe is perfect for Meatless Monday and can also easily be made vegan. If you have followed for long, you know that I’ve explored many different diet trend over the years. I’ve tried Clean Eating, Paleo, Low-Carb, and Keto . To be honest, I find all of the research supporting one diet over another overwhelming. 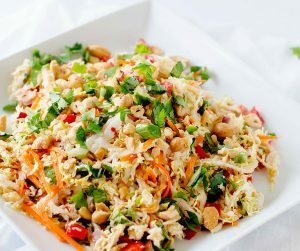 Is it just me or is there a study that proves most any reasonable way of eating is the healthiest diet out there? The one common thread I do see in most all diets, is that the best thing you can do for your health is to load up on plant-based foods. This is something that I can get behind, because this is how I feel my best. I am lucky in that I love vegetables. But I will be the first to admit that when things get crazy, prepping veggies are one of the first things that goes out the window. Now that things are starting to calm down, I’m back to my daily salads. I’m committing to Meatless Monday, and I’m trying to eat more meals like today’s Black Bean Quinoa Burger. Have you ever tried a quinoa burger? I have had so many over the years, and one thing I’ve found is that I enjoy it a lot more if I stop comparing it to a beef burger. They are just so different – but that doesn’t mean that you can’t enjoy both at the appropriate time. 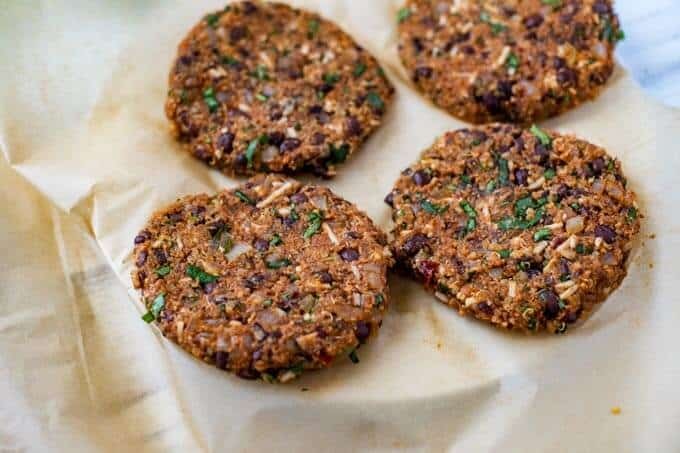 I love that these quinoa black bean patties are packed with a kick of heat from the chipotle chili peppers, garlic, and crushed red peppers. I will admit that six cloves of garlic is a lot, so if garlic is not your thing feel free to dial it down. We can still be friends. Likewise, if cilantro isn’t your jam, simply substitute in parsley. I love to serve this on a bun like a “regular” burger, with a slice of tomato, chopped onions, and spinach. It is especially good with a touch of mayo, or a healthier yogurt or nut based sauce. 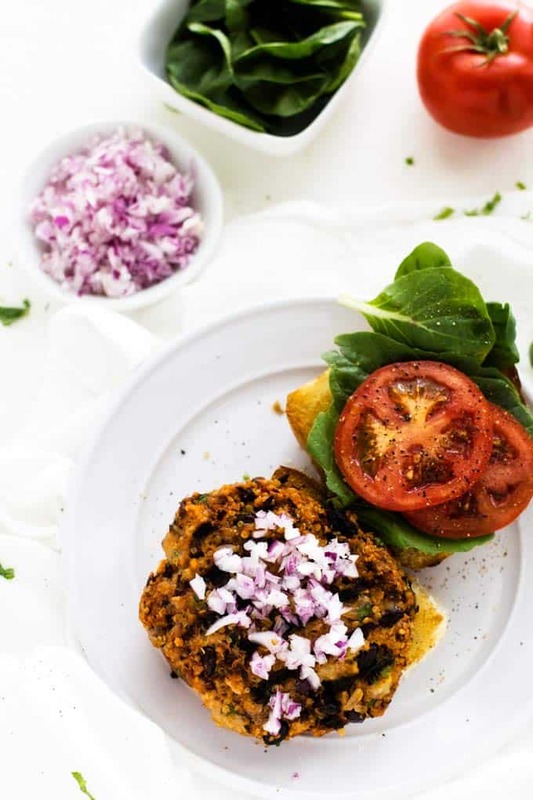 Let me know how it goes if you decide to give this Black Bean and Quinoa Burger a try! I would love to know your thoughts. Are Veggie Burgers Actually Good for You? Homemade Veggie Burgers are very good for you! Loaded with legumes, whole grains and seeds like quinoa, they are an excellent source of plant-based protein. Some packages veggie burgers are good for you, but it is essential that you read the labels. Stick with veggie burgers that have ingredients you recognize and steer clear of GMO ingredients. Are Veggie Burgers Good for Weight Loss? Since they are typically lower in calories than a traditional burger, veggie burgers can be useful for weight loss. Be conscious of the side of the bun you use as well as additional toppings like mayo! You may want to consider serving over a bed of greens. Do Veggie Burgers Taste Like Hamburgers? While Veggie Burgers taste great, you will likely enjoy them more if you don’t try to compare them to traditional burgers. The taste and texture are significantly different, but both can be uniquely delicious. The first thing that you want to do is measure out all of your ingredients. Pulse together 1/2 cup of black beans with the chipotle chili pepper in a food processor. Add it to a bowl with the black beans. 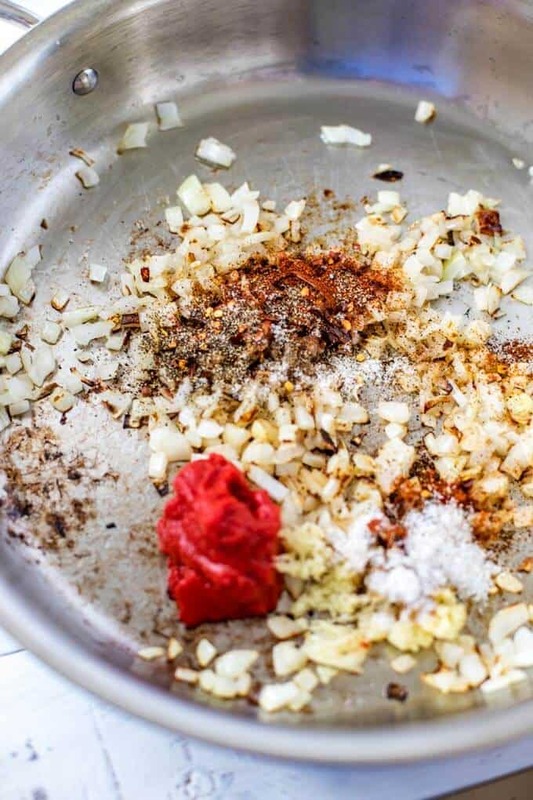 Spray a skillet with oil and cook the chopped onion for 7 minutes. Add in tomato paste and seasonings. Remove from heat and add to the bowl with the black beans. 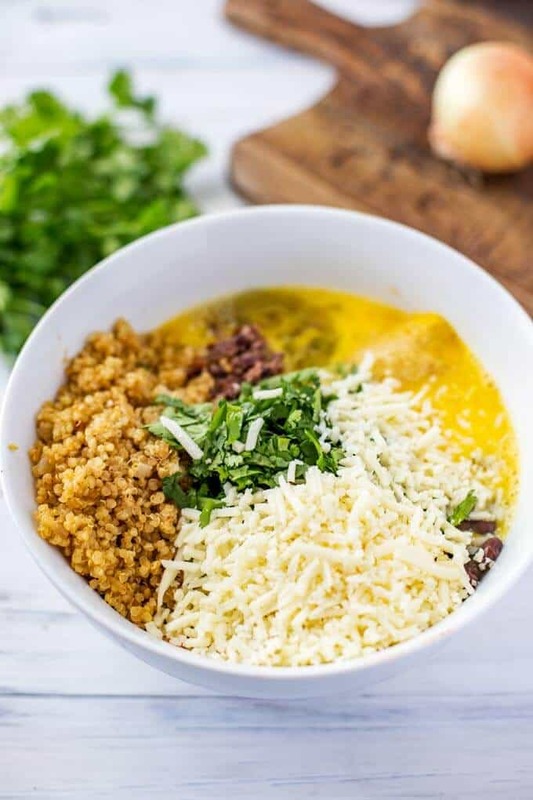 Stir in breadcrumbs, quinoa, and cilantro. Allow to cool for 3 to 4 minutes and stir in eggs and cheese. Form the patties – you can do this by hand or use a burger press if you like. Then cook in oil for 3 to 6 minutes per side. Add in 2 teaspoons of gluten free tamari or coconut aminos and 2 teaspoons of liquid smoke. In place of the chipotle chili, use 1 diced jalapeño, a teaspoon of ground cumin and a teaspoon of smoked paprika. Add in 2/3 cup thawed organic corn. 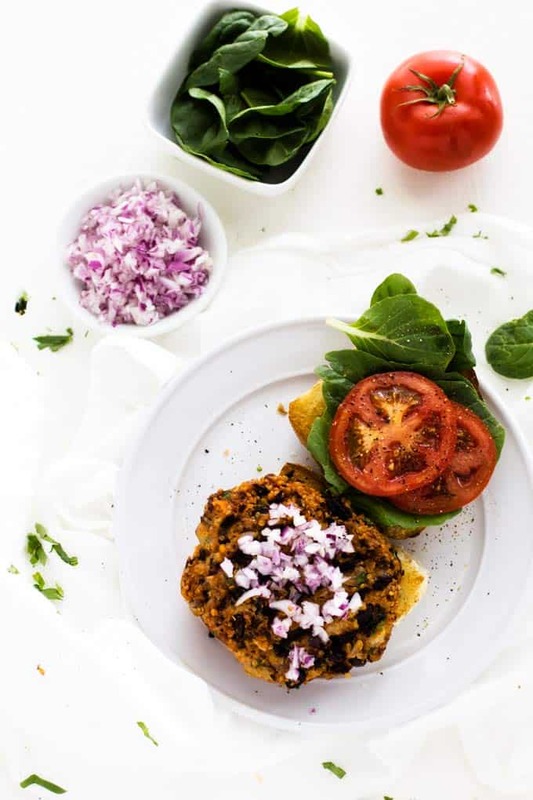 For a healthy lunch or dinner try a Black Bean Quinoa Burger! This easy recipe is gluten-free and loaded with spices – perfect for Meatless Monday. Vegetarian with a vegan option. 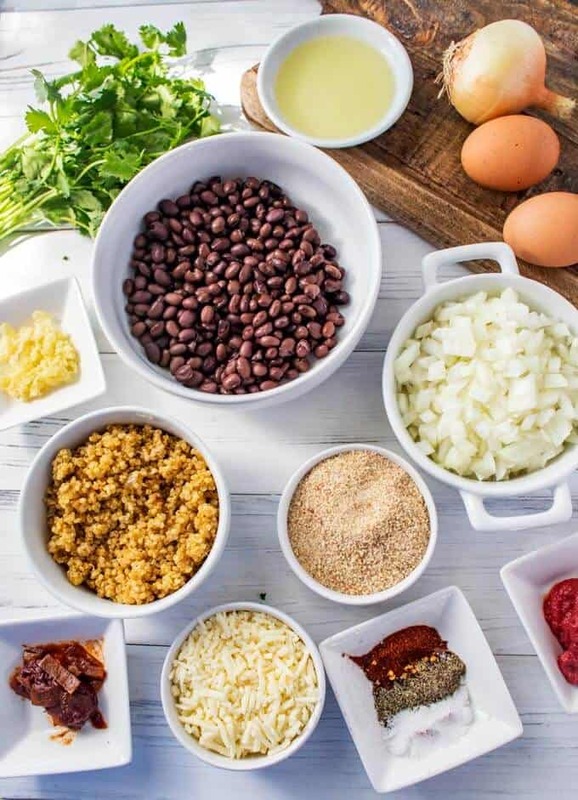 Place ½ cup of black beans in the bowl of the food processor with the chipotle chili. Pulse until well combined. 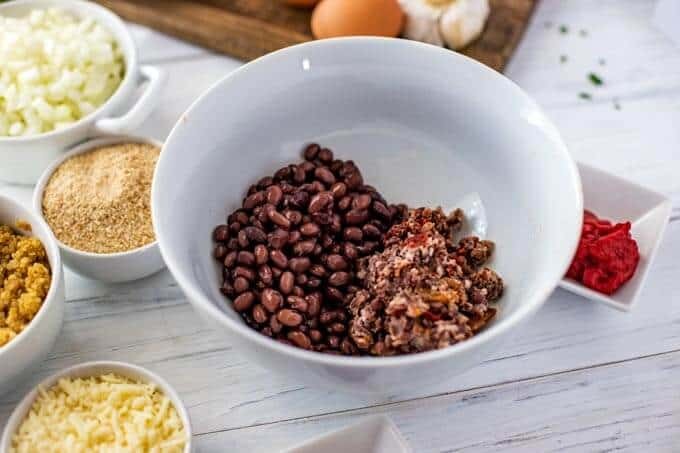 Combine with the remainder of black beans in a large bowl. Heat skillet sprayed with oil over medium heat. Add onion and cook for 7 minutes. Stir in garlic, tomato paste, chili powder, crushed red pepper, salt, and pepper and cook for one more minute. Remove from heat and combine with black bean mixture. Stir in quinoa, breadcrumbs and cilantro. Allow to cool for 3–4 minutes and add in eggs and cheese. Form patties and place in the freezer for 10 minutes. Heat oil large skillet over medium heat. Cook for 3 to 6 minutes per side. Optional: For firmer burgers in the center, bake in a 350 degree oven for 8 to 10 minutes. Serve on buns with desired fixings. Also great over a bed of greens. 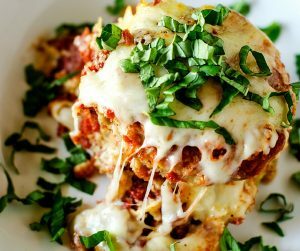 Use Daiya shreds in place of cheese and substitute flax eggs for the eggs. It will not hold together quite as well, so be careful when flipping. Cooking in an Air Fryer works great here. Previous Post: « 4 Great Tips to Achieve a Healthy Smile! My resolution is NOT to make any more resolutions. They never work. I just move forward with improvement in mind. This looks like an amazing and delicious burger. I am going to have to try this recipe very soon! Yummy! That looks fabulous! I am amazed how many different ways you can use black beans. From sweet to savory to burgers! I would have never thought to add them but I bet they bring a delicious flavour! I’ve made black bean burgers before, but could never get them to hold together! I like the idea of adding the quinoa to them. I haven’t made my own veggie or black bean burgers, but this sounds really good. I’ve been cooking with quinoa a lot lately and it sounds like it would be great in this recipe. I have tried different veggie burgers in the past but never a quinoa one! This looks and sounds delicious!! This looks very good. I love that it has quinoa in it too. I know that is a very healthy food, so I must give this a try. This is one of my favorite recipes. It makes my guts feel really good. I would love to try this one. I have recently started enjoying black beans. I bet that is delicious because it has chipotle chili in adobo sauce in it. Yummy! Thanks for the recipe! This sounds so good! I’ve tried making black bean burgers with no success. I think the quinoa would really help so I’ll be trying your recipe! 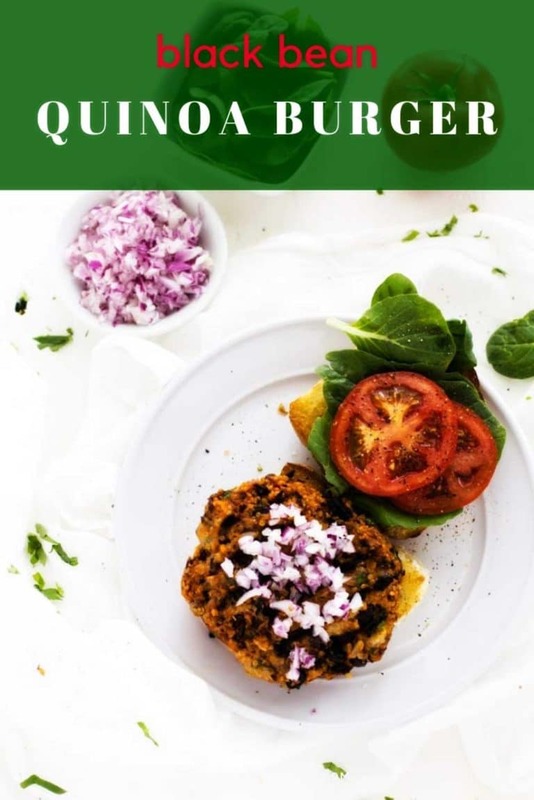 Black bean burgers are delicious, I can only imagine how much better it would be with quinoa! I can’t wait to give these a try, they look delish! I’ve not really eaten Quinoa before, but this sounds like a yummy recipe! I would totally try this sometime. Omg this looks utterly delish! I need to make this asap! 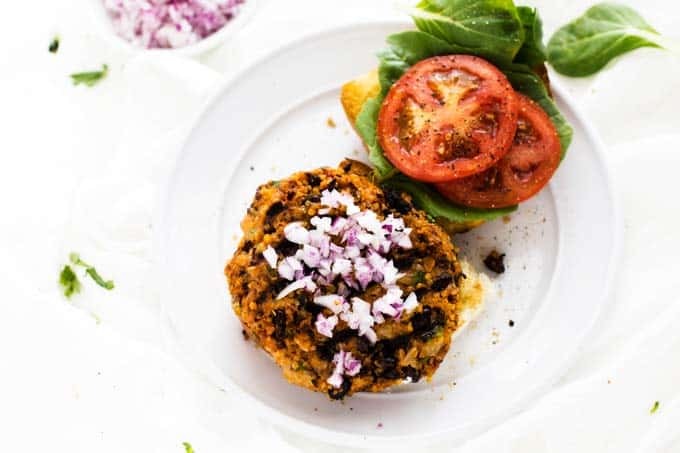 This black bean quinoa burger sounds delicious! I’m not that into garlic so I would definitely cut back on the amount I’d use to remake this recipe. We have made black bean burgers before but never with quinoa in them. Yours look delicious. Thank you for your recipe. I have never tried black bean or quinoa so to use both for a burger would be a new meal to try for me. Looks super tasty. This is such a great idea! Loving it! I would have never thought of a black quinea burger! i wanna try it now! 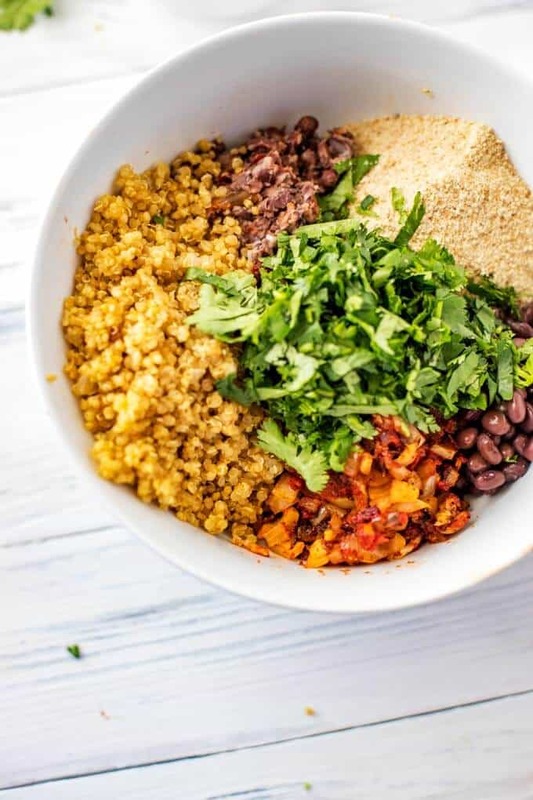 I’ve had black bean in my burger but never quinoa so would love to try this recipe as its much healthier than eating the meat version. Yum! This looks so delicious! I need to make this!! Ummm, so delicious. I have always wanted to learn how to make these. I am glad you shared this recipe. Bookmarking! Recently diagnosed with Arthritis, I began searching for recommended foods to eat. 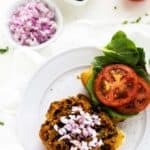 Quinoa was a ingredient for this veggieburger, which looks delicious! Going to start incorporating “meatless Monday” into my diet! Can’t wait get started! 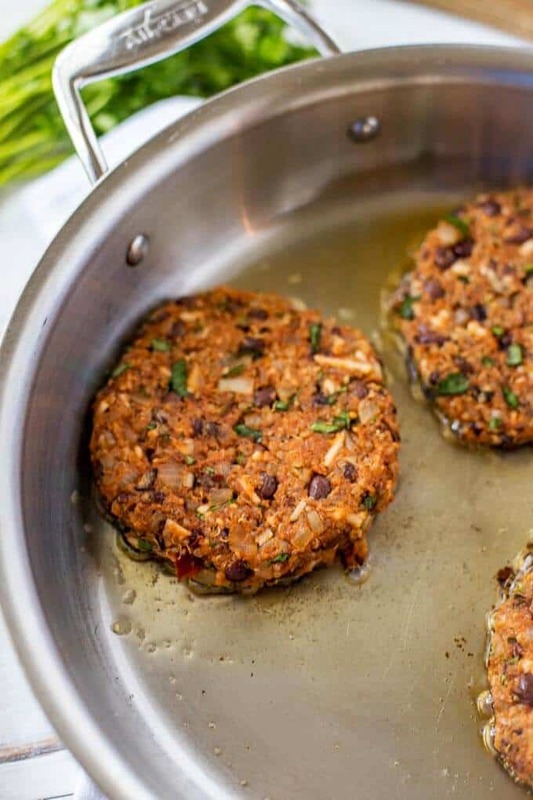 We are a vegetarian family and love to make black bean quinoa burgers together. I like adding a little nutritional yeast to mine too.